This annual or biennial mallow with pale pink or whitish flowers is one of the few wildflowers of the Iberian Peninsula and Mediterranean region to survive the heat past May, which may be due to its ability to form deep roots that gain access to what little water remains in the soil once the summer temperatures soar. This annual or biennial plant usually grows to between 0.3 and 1.5m in height but can sometimes reach 2m. Small Tree Mallow is also known as Cretan Mallow. Lavatera cretica is a synonym of Malva multiflora. 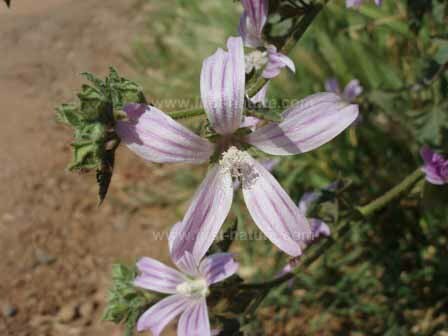 Small Tree Mallow, or Cretan Mallow, can be found throughout the Mediterranean region. This wildflower is also native to Britain, where is a rare find. This member of the Mallow family of plants occurs mainly on cultivated and disturbed ground, along waysides and in waste ground. This specimens shown here were photographed near the coast in the Algarve region of Portugal in May.